This… is a pretty spot on reenactment of my first reaction at the barber shop. I always thought I was one of the lucky 50% of those with psoriasis that don’t get it on their scalp. Yeah, I was wrong, and the way I found out was on a gloriously hot, sunny day. Fast forward to today, and it’s totally clear, thanks to Psoriatrax . But back to the past. It was roughly two years ago, when I went to my local barber after deciding that I would shave all my hair off. For the previous few years I had rocked a mop look, but I wanted a radical change. So he went to work, tufts of hair flying left, right and centre. After butchering my hair, his face lit up with a smile and he picked up a little round mirror to show me his handiwork. That’s when I saw it, a red pancake slapped onto the back of my head. I paid the man with scissors, and ran back home. It was 30°C in London, a hot summer by any measure. I couldn’t wear a hat. Maybe a wig would do? I Googled the crap out of scalp psoriasis, and kept reading about coal tar. It works by slowing down the skin turnover rate wherever it is applied, I read. Sounding good to me, I immediately went out and bought PolyTar, a pretty common coal tar shampoo. Over the next few weeks, my friends thought I had found a new job laying roads based on the stench emanating from my fine noggin. But not so, it was just useless old PolyTar. It didn’t do a thing. And the reason why? It only contained 1% of coal tar! So I went out looking for something with a bit of muscle. Let me introduce you to PsoriaTrax, an absolute beast of a shampoo for scalp psoriasis. Yes, its made from tar. Yes, it smells like a road worker after a 20 hour shift. But give it a chance, and it will gobble up your scalp flakes and spit them out. This baby is around 5 to 10 stronger than anything you’ll find in any pharmacy. I found it after my failed stint with PolyTar. What I read from other flakers convinced me that it was good, and it was! After less than a week of using it, a massive palm-sized patch behind my right ear had disappeared! I kept asking my girlfriend, “Is it still there?”. She’d ruffle through my hair like a monkey looking for lice, and after a week she said that she couldn’t see anything. So, why does it work so well? Because its on steroids. PsoriaTrax contains over 25% coal tar solution, or roughly 5% of pure coal. Other shampoos typically have much, much less. They whimper in its presence. I kept it on my scalp for around 10 minutes before rinsing, and used a regular shampoo afterwards to mask the smell. Now, this was a while back. Following a diet, I have managed to control my scalp psoriasis pretty well. But PsoriaTrax is still stacked away at the back of my bathroom cabinet, at the ready for a flare-up. I can’t recommend it highly enough flakers! 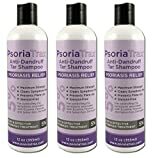 You can get one bottle on Amazon, or save a bit by buying a PsoriaTrax multipack. Hi, this is Vasu. I’m using Psoriatrax and everything ok but new coming hair falling (small baby). Any solution for it ? Hi Vasu, please check with your doctor. Psoriatrax is quite a strong shampoo and I’m not sure if it’s a good idea to use it on delicate baby skin. I too have found Psoriatrax shampoo a miracle product. However, my usual source (Pharmacy Direct) says it is back ordered and other vendors who carry it on-line also say it is now out of stock. This is very concerning. What to do? Has anyone else found a source that actually has it currently in stock? Did you notice any hair loss with the Psoria Trax shampoo. That’s my biggest fear. I didn’t thankfully Nora. Just smelled like a freshly laid road for a bit. Thanks for the question Maud. For me it was a combination of cutting out gluten/dairy/processed food, as well as taking certain supplements such as loads of omega-3 rich fish oil and vitamin d 3. Plus meditating and drinking certain herbal teas. Phew, that sounds like a lot, but most of it is routine. Plus I still have my bottle of PsoriaTrax after whenever I have too much alcohol / bad food in a row. Have you had a food allergy test done? Sounds very healthy to me! I’ve begin to do all those things but not 100% of the time and I can’t say that I have results. In your experience, is it necessary to be very strict in the beginning at least? and how long before you saw results keeping you going? Yes I did a food intolerance test, but I have read it’s not very reliable so I’m thinking about an elimination diet to be sure.